According to the World Health Organization (WHO), the incidence of persons with hydatid cyst in endemic areas is more than 50 per 100,000 population per year. In some parts of Argentina, Peru, East Africa, Central Asia, and China, it reaches 5%-10%. In parts of South America, 20%–95% of animals that are slaughtered are condemned to death because of hydatid cysts. They are the primary morbidity in the Russian Federation, with an incidence of 0.39-0.37 per 100,000 population. North Caucasus is an endemic hotbed of cystic echinococcosis, with an incidence of 1.2–5.6 per 100,000 population. Hydatid cyst of the liver (HCL) occurs at any age, but most patients are probably infected during childhood. In the article Minaev S. et al., 2017  noted that there is no consensus on the surgical treatment of children with hydatid cyst of the liver (HCL). We evaluated the outcomes of laparoscopic and open surgery for childhood HCL. We performed 81 open surgery and laparoscopic procedures in 37 (45.7%) boys and 44 (54.3%) girls with HCL (mean age 9.3 ± 2.1 years) who were assigned to a main group (laparoscopy, n=21) and a control group (open surgery, n=60). Clinical assessments, surgical durations, complications, and postoperative outcomes were investigated. Cyst types in the two groups were I (Gharbi)/CE 1 (WHO-IWGE), 71.4% and 58.3%, respectively; II/CE 2, 19.1% and 25.0%, respectively; and III/CE 3, 9.5% and 16.7%, respectively. The parasitic hydatid cysts were located mostly in the right liver lobe in both the main and control groups (90.4% and 80.0%, respectively). Results Hospital stays were significantly (р<0.05) longer in patients in the control group (12.1 ± 1.5 vs. 5.6 ± 2.2 days). Operation time was significantly (р<0.01) shorter for the main group (90.1 ± 7.8 vs. 120.6 ± 5.3 min). Local complications (residual cavity infection, biliary fistula) occurred in 21.6% of patients in the control group and 14.3% in the main group. Each was treated, and none recurred. There were no apparent systemic complications. Conclusions Laparoscopic surgical treatment for children with HCL is safely in compliance with all classic open surgery principles. 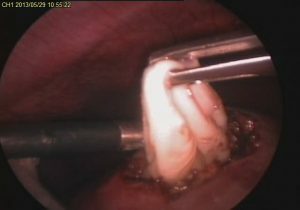 The laparoscopic technique offered a shorter duration of the surgical effects and markedly fewer postoperative complications. In the article Vafin A. Z. et al., 2014  evaluated the results of surgical treatment for liver echinococcosis based on the aparasitism and anti-parasitism principle, an analysis of treatment outcomes was conducted involving 100 patients who underwent surgeries in 1982–1990, through conventional methods (control group) and another 458 patients who received treatment in 1991–2010 after the aparasitism and antiparasitism principle had been introduced in clinical practice to the fullest extent (main group). The aparasitism and antiparasitism principle and plasma technologies implemented for echinococcectomy allowed to significantly improve the outcomes of liver echinococcosis surgical treatment: the rate of postoperative complications was brought down from 36.0 % (control group) to 12.3 % (main group); the post-operative lethal rate reduced from 7 % to 0.4 % respectively; the relapse rate – from 10 % to 1.19 %, while the total number of days spent in the hospital went down from 28.6 to 15. In the article Minaev S. et al., 2013  sixty children (age 3-15 years) with hydatid disease of the liver were treated. The patients were divided into 2 equal groups (control and main groups).The hydatid disease of the liver was revealed in 22 (33.6%) patients, combined hydatid disease of the liver and lung were noted in 38 (66.4%) patients. The “capitonnage” of the residual cavity was applied in the control group and omentoplasty–in the main group. Chemotherapy with Nemazol (dose 10-15 mg/kg/day) was carried out. In order to reduce the negative influence of Nemazol on patients and to accelerate reparation processes of liver parenchyma Vobenzyme (2-3 pills/3 times/day) was applied. The number of complications was 23.2 % in the control group. The adhesive bowel obstruction was noted in 6.6% of patients, bleeding and jaundice in 3.3%, the residual cavity suppuration in 10%. Complications were registered in the main group in 6.6% of children (the adhesive bowel obstruction in 3.3%, preservation of the residual cavity after a year in 3.3%). The number of relapses in the control group was 6 (12%), there were no relapses in the main group. Thus the procedure of preoperative and postoperative chemotherapy allowed avoidance of the development of relapses of hydatid disease of the liver. Omentoplasty is the most rational method of treatment of residual cavity in surgery of hydatid disease of the liver in children. Minaev SV, Gerasimenko IN, Bykov NI, Timofeev SV. Up-to-date approaches in treatment of hydatid disease of the liver in childhood. Хорошая работа! Очень хороший обзор по хирургическому лечению у детей.